It doesn't think. It doesn't feel. It doesn't give up. Yara: [tilts to one side and farts loudly] It got away. Q: What year does the film take place in? Q: What is the final form of "It"?, which Jay refuses to describe? Over 300 reviews, high score and meta-score in a 2 million budget film, that alone should make you watch it. This movie shows a great idea, very simple and elegant, for a horror movie, of course. 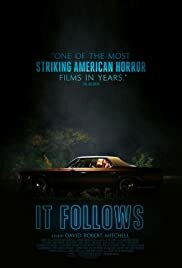 And it's all around good, well played, good sound effects, more suspense, less gore, it has all the elements you expect in a horror movie, and at the same time it is not cliché. The real highlight here is the director, this movie is exceptionally well directed, I mean frames and shot composition makes the movie jump from the screen. If you like horror and not gore movies, watch it. Yes, the movie is a bit slow at first, but it didn't bored me at all. 120 of 233 people found this review helpful. Was this review helpful to you?